I have written, rewritten and deleted this post many times. I don’t like to be controversial or even hint at being controversial. I like to please everyone and be popular. I want everyone to love me. But seeing recent tweets and reading some recent blog posts, I am wondering what do you want from your blog? It is something I’ve been thinking a lot about today. In the past I have read blog posts about people not feeling welcome in the blogoshpere and particulary from bloggers who I consider to be very popular. I have to say, and I don’t like to rock the boat, but I do feel it is a bit like being at school. You are either in with ‘the group’ or you’re not. And I very much feel that I’m not! But, does this actually matter? When I stopped to think about it, I think not. I have several people who read my blog regularly and leave me lovely comments. This to me is the most important thing. I love to read each and every one of these comments and I am so grateful they take the time to stop by. I was of course thrilled (and very surprised!) to be listed at number 70 in the Tots 100 index for March. I still think this must have been a mistake. But nevertheless, it made me smile for a few days. But why? I guess although I’m quite a quiet person I crave some attention and I want to be popular and in with the cool girls (and boys)! 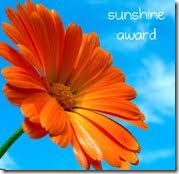 I was really pleased when Thea dropped by to pass on a Sunshine Award to me because she enjoys reading my blog. How exciting is that? Someone enjoys reading my blog and took the time to pass on an award. I’ve never been included in the lists for these sort of things. I see them littered all over other people’s blogs but I never get ‘tagged’ for anything. Probably a blessing as I’m sure if I had to list the contents of my handbag I’d lose my few loyal blog readers! One of our friends refers to my handbag as a holdall! Do you know what I will never be a popular blogger, as I do what I want, I dont offer platitudes or stoke peoples egos. I dont have PR’s banging at my door, but the one I do have a relationship with is great. Thanks Fraggierocks – I’ve never been cool in real life or online, but you’re right – I won’t be losing sleep over such things. Ah, now I clicked through to comment before reading to the end and then I see you have been writing nice things about me. My dear, you are in the cool gang – fact. Your positioning was well deserved as you write a lovely blog, are very active on twitter and are an all round good egg. We may not be in line to win a fancy new laptop *sob* but it wasn’t worrying us last week so it shouldn’t this week. Keep doing what you are doing, send me some cakes and you will find you are as happy with your online home as ever. Aww, thanks for the Sunshine Award Amy. 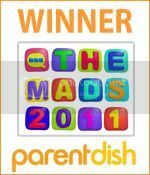 Although my own blog has only been going a few weeks, I’ve been blogging over at Mums The Blog for a year now, and I have NEVER won an award – until now. So thank you, from one unpopular blogger to another! And I think need to create a brand new award all of your own for that Cheese & Bacon scone recipe!! Thanks Amy. I don’t feel like a popular blogger either, I’m not immensely good at it but if one person enjoys reading then its worthwhile to me because I enjoy doing it! The sentiment is right back ‘atcha! I like your blog too. PS If Kat is getting cakes, I want some too. Congrats on the Tots 100 index! That was my first award too, and I know how you feel about not being in “the circle”, I just blog because I enjoy it and I like share. Thanks Thea – I blog because I enjoy it too and that it the whole point of it for me too. Hi – I have just been looking at the UKFBA to see who my ‘friends’ are today and your name popped up! Thought I would visit my fellow foodbloggers sites and catch up with them. Both my blog and also myself are older than most blogs, I don’t twitter or facebook and so your posting struck a chord with me! You do some wonderful baking etc and have a lovely blog. Gosh, Amy, I only just found out you mentioned me by chance! Sorry I’ve come so late to the party but thank you for Sunshine Award 🙂 I’m following you now so I won’t miss your posts anymore!